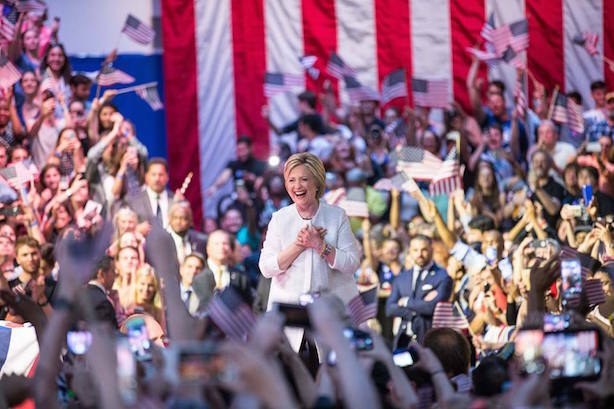 Clinton's historic moment; Sanders says he'll stay in the race; Trump delivers a subdued response; Global PR execs weigh in on presidential contest, corporate crises; Ellen Pao signs book deal. The former secretary of state became the first woman to lead a major U.S. political party on Tuesday night when primary wins in New Jersey and the just-called-Wednesday-morning race in California pushed her past the delegate threshold needed to win the Democratic nomination. At her victory event in Brooklyn, New York, Clinton’s team unveiled a video putting her alongside other history-making women. A super PAC allied with Clinton is planning to attack Donald Trump with an ad showing his mocking of a disabled reporter from The New York Times, according to Politico. The insurgent Democratic candidate is promising to stay in the race through Washington, D.C’s primary next Tuesday, despite plans to lay off half the campaign’s staff. He’s set to meet with President Obama on Thursday. Sanders aides who spoke on background with Politico say their candidate won’t face the fact that his campaign is over. Supporters on Twitter praised the Vermont senator for his run with the #ThankYouBernie hashtag. After nearly a week of stinging criticism over his remarks about the judge in the Trump University case and a few disavowals from members of his own party, Donald Trump gave a subdued, teleprompter-enabled victory speech on Tuesday night. (The real-estate tycoon had mocked other candidates for using teleprompters). He previewed his line of attack against Hillary Clinton, saying he’ll give a speech next week depicting the presumptive Democratic nominee as having used her positions to enrich herself. Trump swept all five Republican primaries on Tuesday. The members of PRWeek’s Global Power Book 2016 backed Hillary Clinton as the next president of the United States, though many weren’t happy with the choices on the ballot. Asked which brand suffered the worst reputational damage of the past year, they overwhelmingly picked Volkswagen, which is still suffering from its "defeat device" emissions scandal. What’s it like to be a high-powered woman in Silicon Valley? That’s supposed to be the crux of Ellen Pao’s book, to be titled "Reset," which publisher Random House says will detail her time running Reddit and at venture capitalist firm Kleiner Perkins Caufield & Byers, which she sued for gender discrimination. She lost the suit last year, but it kicked off a wider debate about what many see as the boy’s club attitude of many in Silicon Valley.